The healthcare analytics field is highly dynamic and rapidly growing, driven by factors ranging from greater availability of data through electronic health records to the increasing focus on value-based care. More than 50% of health organizations are seeking data expertise. As a result, professionals in healthcare analytics careers will benefit from a high-demand and growing skillset and the ability to pursue opportunities at many different levels of their organizations, from analytics managers to C-Suite executive positions. 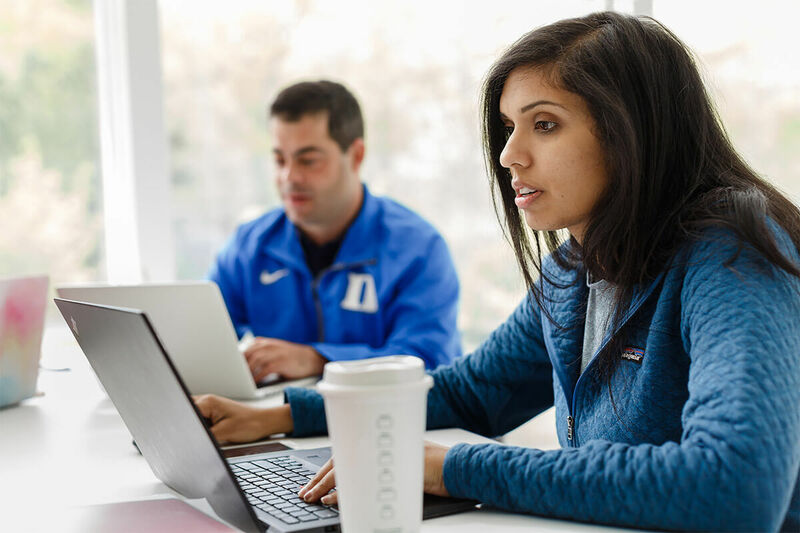 Duke’s Fuqua School of Business offers an abundance of career services to ensure our students can develop their careers. These services combined with the expertise gained in the online MQM: Health Analytics program can empower you to lead the transformations that will be caused by analytics. We are committed to empowering our students and graduates with an elite education, as well as a full suite of career services available to both our on-campus and online students. These services include access to exclusive job search databases and an extensive network of 22,000+ business school alumni who share a desire for lifelong growth and learning. Career Coaches provide 1:1 coaching virtually, tailored to your needs. Fuqua’s coaches help you navigate all aspects of successful career management, from the start of your program to beyond graduation. Business Development staff are charged with educating organizations on the capabilities of our graduates, connecting prospective employers with Fuqua, and building relationships with key firms. Student and Alumni Services teams provide relevant workshops, deliver online content, and build resources for current students and graduates. The Ford Library, where you can find customized support to guide and enhance your job search efforts through our library system. Career Services System, where you can search job postings and find company contacts and other resources in the Fuqua Global Talent System (GTS), our internal career services website. GoinGlobal, a database of country-specific career information. You get access to country career guides, regional city market guides, corporate profiles, employer directories, and a directory of international job listings. Resume Database for employers and executive search professionals. You’ll be able to post a basic profile, your resume and job search preferences within the database. Searchable Alumni Directory of more 22,000+ business school alumni and more than 160,000 Duke University alumni. You can access the Fuqua School alumni directory once you matriculate and the Duke University directory once you graduate from Fuqua.